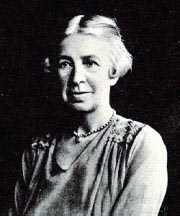 O God, Origin, Sustainer, and End of all creatures: Grant that thy church, taught by thy servant Evelyn Underhill, may continually offer to thee all glory and thanksgiving, and attain with thy saints to the blessed hope of everlasting life, which thou hast promised us by our Savior Jesus Christ; who with thee and the Holy Ghost liveth and reigneth, one God, now and forever. Amen. O God, Origin, Sustainer, and End of all creatures: Grant that your church, taught by your servant Evelyn Underhill, may continually offer to you all glory and thanksgiving, and attain with your saints to the blessed hope of everlasting life, which you have promised us by our Savior Jesus Christ; who with you and the Holy Spirit lives and reigns, one God, now and forever. Amen. This commemoration appears in Lesser Feasts and Fasts 2018 with revised lessons and collects. To go up alone into the mountains and come back as an ambassador to the world, has ever been the method of humanity's best friends. Miss Underhill (Mrs. Hubert Stuart Moore) taught that the life of contemplative prayer is not just for monks and nuns, but can be the life of any Christian who is willing to undertake it. She also taught that modern psychological theory, far from being a threat to contemplation, can fruitfully be used to enhance it. In her later years, she spent a great deal of time as a lecturer and retreat director. She died on June 15, 1941. Besides the above, several of her older (out of copyright) books are available on Google Books and the Internet Archive.